In this article, we’ll discuss how you can use the URLSession suite of components, classes and functions to make HTTP GET and POST network requests. You’ll learn how to validate response data, and how to add additional parameters like headers to requests. Almost every app will communicate with the internet at some point. How does that work? And what Swift code can you use to make HTTP networking requests? Fetching and downloading data from and to webservices is a skill any pragmatic iOS developer must master, and URLSession offers a first-party best-in-class API to make networking requests. Imagine you’re making a Twitter app. At some point, the app needs to request data from Twitter’s API. When a user views their timeline, you could use the Twitter API to get information about their tweets. The Twitter API is a webservice that responds to HTTP(S) requests. On iOS, we can use the URL Loading System to configure and make HTTP requests. This is called networking, and it’s a staple in any modern iOS app – almost all apps communicate with servers on the internet, at some point. Quick Note: From a security perspective, it’s important you get into the habit of defaulting to HTTPS, i.e. networking requests encrypted with SSL/TLS, when working with URLs. You can get SSL certificates for free via Let’s Encrypt. Since iOS 7, the de facto way of making HTTP networking requests is by using a class called URLSession. The URLSession class is actually part of a group of classes that work together to make and respond to HTTP requests. Many developers also rely on 3rd-party libraries, such as Alamofire, but you’ll soon find out that you don’t need to depend on a library for simple HTTP networking. The URLSession class has everything we need already. You use URLSession to create a session. You can think of a session as an open tab or window in your webbrowser, which groups together many HTTP requests over subsequent website visits. The URLSession is used to create URLSessionTask instances, which can fetch and return data to your app, and download and upload files to webservices. You configure a session with a URLSessionConfiguration object. This configuration manages caching, cookies, connectivity and credentials. To make a request, you create a data task, of class URLSessionDataTask, and you provide it with a URL, such as https://twitter.com/api/, and a completion handler. This is a closure that’s executed when the request’s response is returned to your app. When the completion handler is executed, you can inspect the returned data and take appropriate action, such as loading the data into a Tweet UI. You use a URLSession to make multiple subsequent requests, as URLSessionTask instances. A task is always part of a session. The URLSession also kinda functions like a factory that you use to set up and execute different URLSessionTasks, based on the parameters you put in. Data tasks send and receive data with URLSessionDataTask, by using NSData objects. They’re the most common for webservice requests, for example when working with JSON. Upload tasks send files to a webserver with URLSessionUploadTask. They’re similar to data tasks, but URLSessionUploadTask instances can also upload data in the background (or when an app is suspended). Download tasks download files from a webserver with URLSessionDownloadTask by directly writing to a temporary file. You can track the progress of file downloads, and pause and resume them. 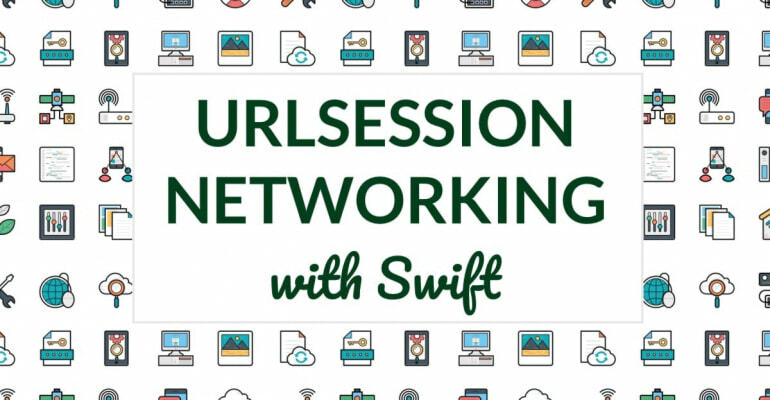 Let’s get started with making a few networking requests with URLSession! The official Apple documentation for URLSession is extensive, but it’s not as organized as you’d want. A good starting point is URL Loading System, and subsequently reading linked articles, such as Fetching Website Data into Memory. And if you want a primer on how to make the most of Apple’s Developer Documentation, make sure to read How To Use Apple’s Developer Documentation For Fun And Profit. let url = URL(string: "https://learnappmaking.com/ex/users.json")! The URL we’ll request is https://learnappmaking.com/ex/users.json. In the above code we’re initializing a url constant of type URL. The initializer we’re using is failable, but since we’re certain the URL is correct, we use force-unwrapping to deal with the optional. The URLSession.shared singleton is a reference to a shared URLSession instance that has no configuration. It’s more limited than a session that’s initialized with a URLSessionConfiguration object, but that’s OK for now. A few things are happening here. First, note that we’re assigning the return value of dataTask(with:completionHandler:) to the task constant. This is that data task, as discussed earlier, of type URLSessionDataTask. The dataTask(with:completionHandler:) has two parameters: the request URL, and a completion handler. We’ve created that request URL earlier, so that’s easy. The completion handler is a bit more complicated. It’s a closure that’s executed when the request completes, so when a response has returned from the webserver. This can be any kind of response, including errors, timeouts, 404s, and actual JSON data. The closure has three parameters: the response Data object, a URLResponse object, and an Error object. All of these closure parameters are optionals, so they can be nil. The error object contains an Error object if an error occurred while making the request. When no error occurred, it’s simply nil. The nature of HTTP requests is flaky, to say the least. You’ll need to validate anything you get back: errors, expected HTTP status codes, malformed JSON, and so on. You could get a 200 OK response back, with HTML, even though you expected JSON. You’ll see how we deal with this, later on. By calling the resume() function on the task object, the request is executed and the completion handler is invoked at some point. It’s easy to forget calling resume(), so take note! You can use delegation with URLSessionDelegate instead of completion handlers. I personally find using closures more convenient, especially because you can use promises and PromiseKit to deal with them more easily. Quick Note: The above snippet uses trailing closure syntax. When a function’s last parameter accepts a closure, you can write that closure outside the functions parentheses (). Makes it much easier to read! The data value prints something like Optional(321 bytes). Hmm, why is that? It’s because data is a Data object, so it has no visual representation yet. We can convert or interpret it as JSON though, but that requires some more code. The response is of type NSHTTPURLResponse, a subclass of URLResponse, and it contains a ton of data about the response itself. The HTTP status code is 200, and from the HTTP headers we can see that this request passed through Cloudflare. And the error? It’s nil. Fortunately, no errors were passed to the completion handler. That doesn’t mean the request is OK, though! Did any errors occur? You can check this with the passed error object. Is the HTTP response code expected? Did you get data in the right format? The first condition is an optional downcast from response of type URLResponse to HTTPURLResponse. This downcast ensures we can use the statusCode property on the response, which is only part of HTTPURLResponse. The range (200...299) is a sequence of HTTP status codes that are regarded as OK. You can check all HTTP status codes here. So, when statusCode is contained in 200...299, the response is OK. When it’s not OK, for example if we get a 500 Internal Server Error, the function handleServerError() is called and we return the closure. The above code uses the same guard let syntax to make sure that response.mimeType equals application/json. When it doesn’t, we’ll need to respond appropriately and attempt to recover from the error. You see that there’s a great number of errors that can occur, and you’ll need to validate most if not all of them. And we haven’t even dealt with application errors, such as “Incorrect password!” or “Unknown User ID!” It’s a smart idea to consider what kind of errors you’ll encounter, and to come up with a strategy or model to deal with them consistently and reliably. We’re using the jsonObject(with:options:) function of the JSONSerialization class to serialize the data to JSON. Essentially, the data is read character by character and turned into a JSON object we can more easily read and manipulate. It’s similar to how you read a book word by word, and then turn that into a story in your head. The optional binding with try? is a trick you can temporarily use to silence any errors from jsonObject(...). In short, errors can occur during serialization, and when they do, the return value of jsonObject(...) is nil, and the conditional doesn’t continue executing. In the above code, errors thrown from the line marked with try are caught in the catch block. We also could have rethrown the error, and dealt with it in another part of the code. Quick Tip: If you run the above code in Xcode Playground, it’s smart to use PlaygroundPage.current.needsIndefiniteExecution = true to enable infite execution. You can halt the playground again with PlaygroundPage.current.finishExecution(), for example when the async HTTP request returns. Don’t forget to import PlaygroundSupport. Another typical task of HTTP networking is uploading data to a webserver, and specifically making so-called POST requests. Instead of fetching data from a webserver, we’ll now send data back to that webserver. A good example is logging into a website. Your username and password are sent to the webserver. And this webserver then checks your username and password against what’s stored in the database, and sends a response back. Similarly, when your Twitter app is used to create a new tweet, you send a POST request to the Twitter API with the tweet’s text. let url = URL(string: "https://example.com/post")! With the above code, we’re first creating a session constant with the shared URLSession instance, and we set up a URL object that refers to https://example.com/post. Then, with that url object we create an instance of URLRequest and assign it to the request variable. On the last line we change the httpMethod to POST. You can also use the URLRequest object to set HTTP Headers. A header is a special parameter that’s sent as part of the request, and it typically contains special information for the webserver or the web application. A good example is the Cookie header, that’s used to send cookie information back and forth. This is fairly easy. You can set a value of a given header field. The first header indicates that the request type is JSON, and the second header is just bogus. The request needs a body. This is some data, typically text, that’s sent as part of the request message. In our case, it’ll be a JSON object that’s sent as a Data object. "message": "So long, thanks for all the fish!" The above step uses that same JSONSerialization class that we used before, but this time it does the exact opposite: turn an object into a Data object, that uses the JSON format. It also uses try! to disable error handling, but keep in mind that in a production app you’ll need to handle errors appropriately. We can now send the jsonData to the webserver with a URLSessionUploadTask instance. It’s similar to what we’ve done before, except that we’ll use the request and the data to create the task, instead of just the URL. In the above code we’re creating an upload task with session.uploadTask(..., and provide request and jsonData as parameters. Instead of creating a simple data task, the above request will include those headers, body and URL we configured. As before, we can specify a completion handler, and the request is started once we call task.resume(). Quick Tip: If you want to debug network requests, I recommend Charles Proxy. And if you want to inspect or mock requests and webservice APIs, check out the excellent Paw app. This little dance you do when making HTTP request is inherent to how the internet works. You request a resource from a webserver, validate the response, and take appropriate action. On iOS, you can use URLSession to set up and make networking requests. It’s as straightforward as it gets, with practical objects such as HTTPURLResponse that give insight into what’s happening.